We are expertise in the manufacturing of a precision engineered range of Oil Filtration Plant. 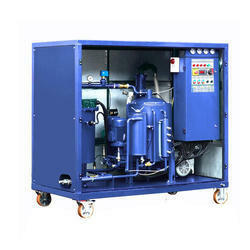 Oil Filtration Plant purify and upgrade transformer oil to comply with standard specifications. These plants can be designed as per customer’s specifications and are also available in varying capacities covering a whole range of applications in low, high and extra high voltage equipments. Turbine Oil Filtration Plant is widely preferred in market for its superior functionality as well as performance. Has the capacity to equal or surpass 200 and make the cleanness, Breaks emulsification thoroughly with high- molecule polymeric material. Our Transformer Oil Filtration Plant are used to remove impurities from transformer and switchgear oil such as moisture, dirt, air and other gases. This is a `low temperature and high vacuum` principle based equipment as per the International Standards 6034 (1989) and its latest revision.We manufacture plants of variable capacities of 600 to 10000 lph which can be customized to special capacities if required by the clients. This plant takes the impure oil into the system through the inlet ball valve and then pumps it through by a positive displacement pump. A filter prior to this removes solid particles up to 1 mm size and magnetic particles. After heating the oil up to 60°C it passes through the cartridge filters, where particles up to 5 microns are filtered. A specially designed vacuum chamber removes moisture, air and all the gases with the help of vacuum. The oil falls by way of gravity over the media inside forming a thin film of oil, exposing a larger surface area. The dissolved moisture and gases are evacuated and the oil is ready. 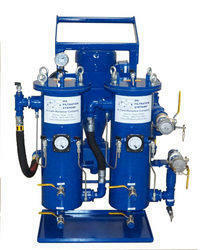 We are expertise in the manufacturing of a precision engineered range of Oil Filtration System. Available in various flow rate options, these are suitable for up-gradation purification and reclamation/ regeneration of insulating oils. These plants can be designed as per customer’s specifications and are also available in varying capacities covering a whole range of applications in low, high and extra high voltage equipments. Based on our unwavering efforts, we have become a name synonymous with quality and reliability. Looking for Oil Filtration Plant ?